New lis pendens filings in Tallahassee grew 56% in October when compared to October 2011, and foreclosure sales jumped by 235%. 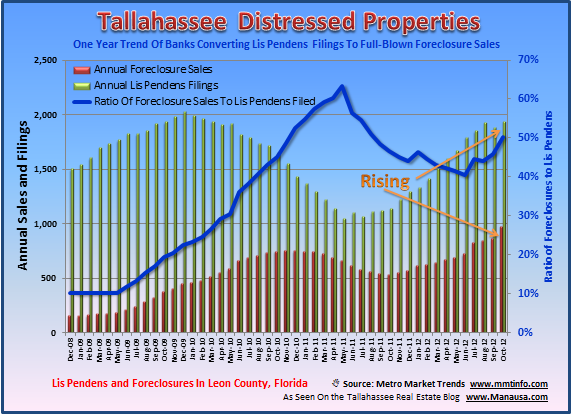 The continuation of mass foreclosure filings means that there are still a lot of distressed properties moving towards the Tallahassee real estate market. Currently, the foreclosure sale to Lis Pendens filings ratio has dropped from an all time high 13 months ago to 50%, as we can see with the blue line in the foreclosure graph below.